On July 5th, 2007, while serving in a Personal Security Detachment platoon charged with escorting a Lt. Col, Allbaugh was riding in the lead Humvee on a mission near the Syrian border. As the Humvee drove over a pot hole, the rear tire detonated an IED causing the explosion that took Cpl Allbaugh’s life. While growing up, he spent time playing basketball, fishing, and lifting weights, but never lost sight of his dream – to serve his country. From an early age, Jeremy knew he wanted to serve in the military, wearing fatigues and camo any chance he got. At only 17 years old, with the permission of his parents, Jeremy enlisted in to the Marines to begin living his dream. Although he lived a short life, his family and friends say that he lived a very full one; he spent every day committed to his role in Iraq and in the Marines. “It was his calling. It was what he wanted to do with the rest of his life,” Jason Allbaugh, his brother, said. Cpl Allbaugh was 21 years old from Luther, Oklahoma. 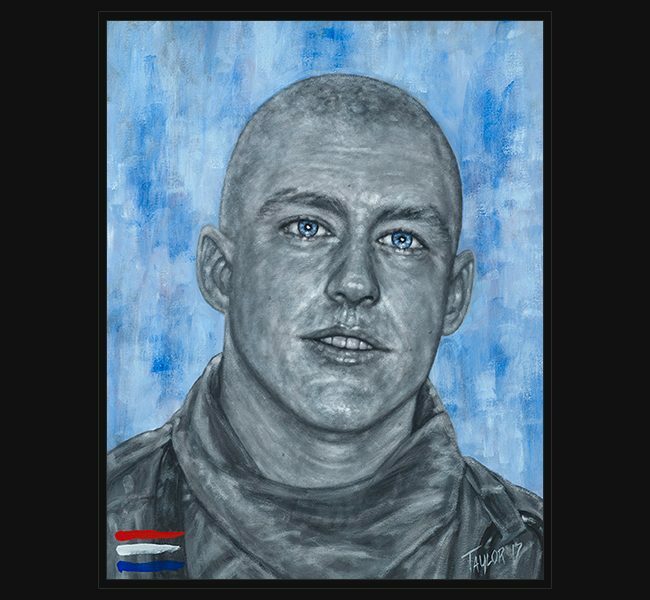 Original portrait was delivered at The National Gallery in Addison, Texas in a special presentation presented by Vizient to his mother, Jenifer Allbaugh, and his family.